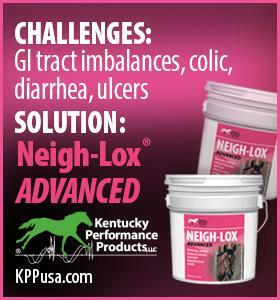 Kill your tack hoarding issues and starting the year with a fresh coat of awesome! I recently moved barns, and by far the biggest adjustment for me off the bat was that my tack room situation basically went from the Wild Wild West to feeling like I was living in Monica Gellar’s spare bedroom. On the one hand, there’s less mouse problems and the new barn looks very tidy with everyone’s assigned cubbies and locks, but on the other hand, it meant that I had to fit all my stuff into my assigned cubby. This is even more hilarious when you know that people would see my section of the old barn’s tack room and reflexively ask me, “Wow, how many horses do you have? 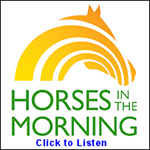 !” and I would have to admit, “Um, just the one.” Hi, my name is Lorraine, and I have a tack hoarding problem. While downsizing can certainly be a frazzling experience, It’s also a great feeling to have everything clean, where you want it, and within easy reach. Here are the 10 commandments of tack hoarding, guaranteed to make you a born-again master of tidiness. 1. Admit You Have A Problem: If your stuff is in a cubby, stacked boxes, or taking up a whole room/shed unto itself, pull out every last item from its storage and lay it out on the ground. Accepting how much you’ve hoarded is the first step to recovery. 2. Ditch Your Duplicates: This is by far the easiest place to start. Do you really need seven pads for one saddle in varying colors? Probably not. Keep the ones that you use ALL the time, the ones you show in, and ditch the rest. Even the cat agrees. 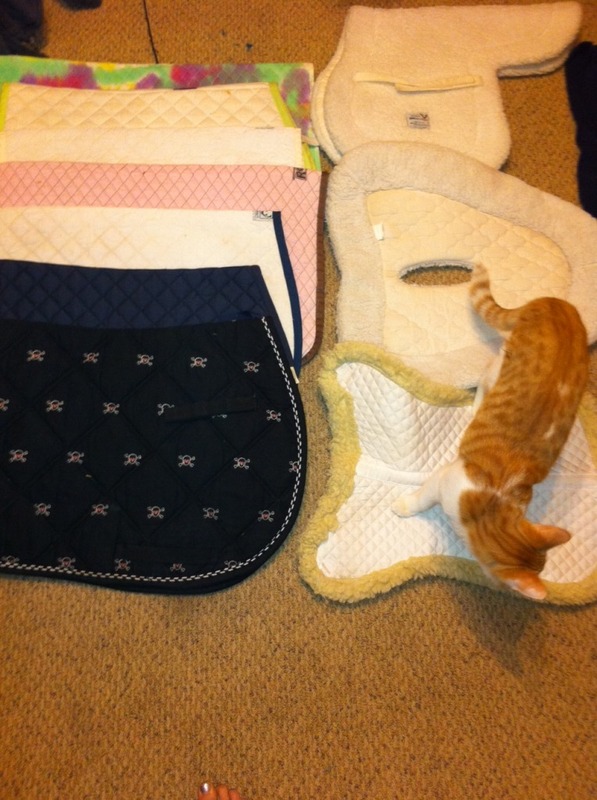 you don’t need this many saddle pads. 5. Be Brutal: In one of my trunks, I had this western green nylon headstall that I won when I was in 4-H um, SEVENTEEN YEARS AGO. It has never fit a single horse I own, and I don’t even ride western anymore, but the horse with whom I won the headstall was my childhood BFF. It’s so easy to be sentimental about tack, and I always keep some little piece of tack from each horse I’ve owned, but there’s no need to keep every piece when it could be doing someone else some good. 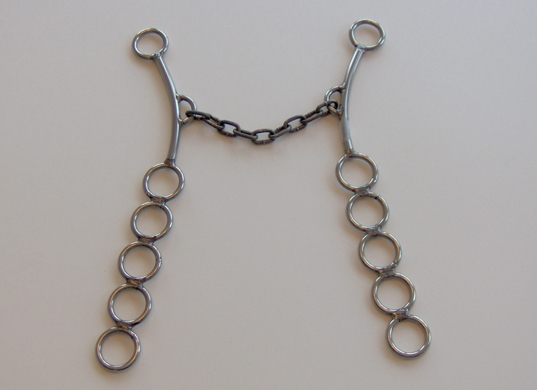 The headstall will never bring back the horse that won it. Consider taking a picture of it before you consign or donate, so you can always recall the memory. In which case, maybe just bury it in the desert. I don’t think ANYONE needs this bit. 7. Turn Over a New Leaf – One of the most helpful elements for me was giving away the totes that I was keeping a bunch of my stuff in. The thing about totes and trunks is that it’s really easy for something to end up at the bottom of a box and never be used again. Instead, I put up a ton of hooks so that everything I owned could hang in my cubby where it was visible and accessible. If a year later I’m still not using something, it’ll be obvious, and I might consider letting it go (vet supplies and that sort of thing I still keep in an airtight box). 8. Invite the Light In With Some Paint – Obviously if you’re a boarder, you can’t always take advantage of this option, but I find a bright white coat of paint on the wall makes it MUCH easier to see your stuff, and also to identify a pest problem. 9. Stake Your Claim – If you have multiple horses or board at a busy facility where stuff wanders off, now is a great time to make sure all of your stuff is tagged with your name in Sharpie or neon duct tape. 10. Do Not Fear Change – Assuming you live somewhere with four seasons, your tack space is always going to be fluctuating, and the best thing you can do going forward is to plan accordingly. With a bit of thoughtful planning, you can store your summer horse camping or show gear in the same box you used to store your winter turnout blankets, and save yourself a ton of space without having a stack of half empty trunks. 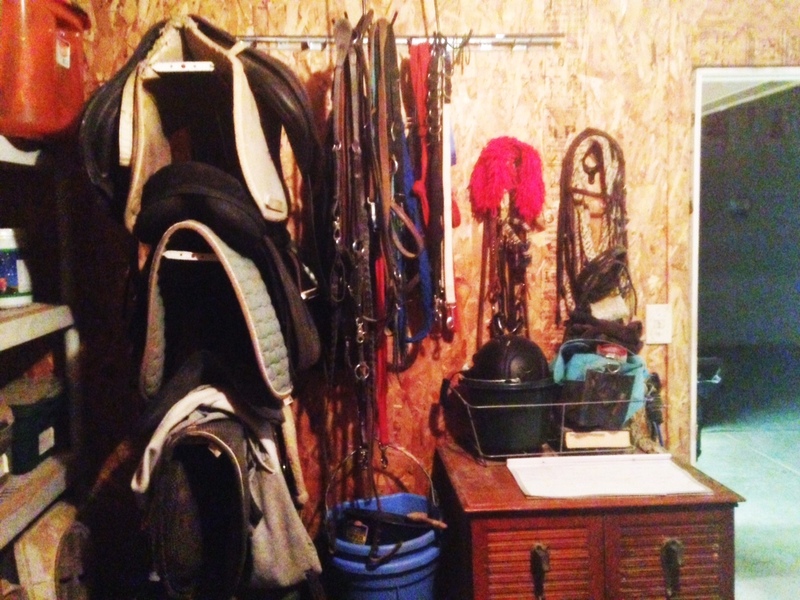 Your tack room should be a constantly shifting space to meet the daily needs of you and your horse or horses, but with a bit of calculation and elbow grease, you can make that organization work for you, not against you, and save yourself a ton of green in the process.